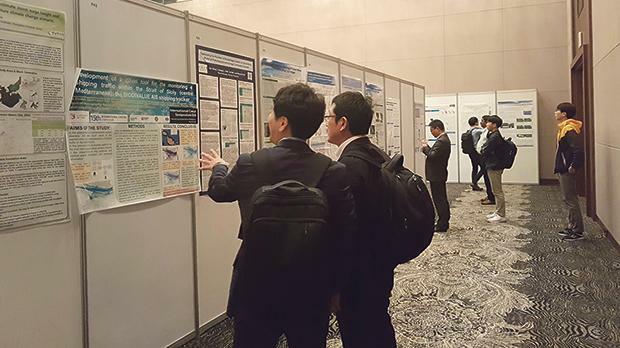 Four academics from the University of Malta recently presented their marine-related research at the 15th edition of the International Coastal Symposium (ICS) in Busan, South Korea. The Maltese academics – Prof. Alan Deidun, Dr Anthony Galea and Dr Adam Gauci from the Department of Geosciences of the University of Malta’s Faculty of Science, and Dr Joel Azzopardi from the Department of Artificial Intelligence – presented two peer-reviewed papers as posters at the conference. The first paper was an analysis of four years of shipping data in Maltese waters. The second was an analysis of data regarding the occurrence of jellyfish in local waters obtained through the Spot the Jellyfish citizen science campaign. The latter paper presented the results of research conducted by Marija Pia Gatt as part of her dissertation for the MSc in Applied Oceanography. The two papers were also published in the Journal of Coastal Research and may be accessed online at https://www.researchgate.net. The first study involved the processing and interpretation of Automated Identification System (AIS) data collected since February 2013 via an antenna set up at the premises of the University’s Physical Oceanography Research Group through the Biodivalue Italia-Malta project. During the project a second AIS antenna was also installed on Lampedusa, and the combined coverage of the two AIS antennae covered large swathes of the central Mediterranean, through which an estimated 25 to 30 per cent of the global oil traffic flows. The AIS data enabled the researchers to decipher important attributes of each recorded vessel, such as geographical coordinates, dimensions, draught, speed, ship type, distance from shore and even port of destination, permitting a full characterisation of the shipping traffic in the central Mediterranean, with the system being able to distinguish between anchored vessels and those in transit. This data facilitates the assessment and management of shipping-related risks, such as that of oil pollution, of collisions with marine mammals and of ballast water discharge, besides the density of anchoring impact on the seabed. The data analyses also allows the characterisation of shipping making use of Malta’s designated bunkering zones. An interesting statistic emerging from the data analysis is that, during the period June 2016 to June 2017, a total of 170,000 vessels passed through the Malta-Sicily Channel without entering Maltese territorial waters, of which just over 35 per cent (i.e. about 6,000 vessels) were oil carriers. A user interface is available online at the link below, enabling the public to search through the database for shipping traffic data of interest.